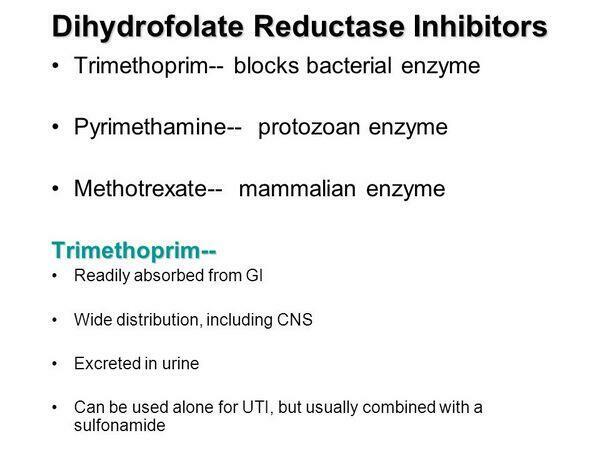 The dihydrofolate reductase (DHFR) inhibitors target bacterial DHFR, an enzyme involved in the folic acid pathway, thereby disrupting bacterial replication. DHFR inhibitors target both gram-positive and gram negative-bacteria and hence could serve as broad-spectrum antibacterials. Trimethoprim/sulfamethoxazole (Roche’s Bactrim, Monarch’s Septra, generics), the most common folic acid biosynthesis inhibitor, was used in the past to treat RTIs such as mild pneumonia and sinusitis. However, the emergence of S. pneumoniae resistant to trimethoprim/sulfamethoxazole, concerns regarding sulfa hypersensitivity, and poor activity against atypical RTI organisms has limited its use. Newer drugs in this class are being designed that overcome current mechanisms of resistance and provide a better spectrum of coverage against RTI pathogens. These agents may become increasingly important over the next 10-20 years as resistance to current drug classes builds. The folic acid pathway inhibitors act by blocking the action of the bacterial DHFR enzyme — an enzyme essential for the synthesis of thymine nucleotides. By inhibiting the synthesis of thymine nucleotides, DNA and RNA synthesis is prevented, thereby killing the bacteria. More specifically, in thymine synthesis, folate donates a methyl group to uracil to make thymine. In the process, the folate molecule is oxidized and must be reduced by DHFR to allow another cycle of synthesis. If DHFR is inhibited, the absence of reduced folate causes a precipitous drop in the levels of thymine nucleotides, causing uracil to be erroneously incorporated in its place in growing DNA strands. Replication is eventually disrupted by this process, killing the bacteria. Bacterial DHFR is distinct enough from human DHFR that drugs targeting the bacterial DHFR protein are generally not toxic to human cells. Arpida licensed all commercialization rights to the DHFR inhibitor iclaprim (AR-100) from Roche. The drug has the potential to be used against serious antibiotic-resistant infections, including RTIs. The agent has completed Phase II trials in Europe in treatment of skin infections and was shown to be well tolerated and to have high clinical and microbiological response rates in these infections. While no information is available regarding its development for acute exacerbations of chronic bronchitis, iclaprim’s spectrum of activity makes it a potential emerging candidate for the treatment of this indication. Previous clinical trials have evaluated an IV formulation of iclaprim, but Arpida is working to develop an oral formulation as well. Iclaprim targets a range of bacterial pathogens, including MRSA and vancomycin-resistant S. aureus (VRSA). Results from in vitro studies suggest that the potency of iclaprim against C. pneumoniae is similar to that of leading antibacterials used in RTIs, such as azithromycin and levofloxacin. While the agent is being developed for skin infections, it demonstrated good activity against gram-positive and gram-negative pathogens involved in RTIs such as S. pneumoniae and H. influenzae as well as intracellular pathogens such as Chlamydia. Therefore, it has the potential to be developed for acute exacerbations of chronic bronchitis. Availability in both oral and IV forms could give the agent an advantage in the hospital setting and for oral step-down therapy.